I'm all about country. If it has horses, cowboys, cowgirls, bulls, country musicians, or traveling in or out in the country (any country), I’m interested in photographing it! I also have a love of teaching. I am based in Phoenix in the wonderful state of Arizona. I invite you to visit my links below. One day in late April of 2008, Linda Lawson of the PVCC's computer commons came to me and in a reasoned way explained why it was making more sense to offer some computer labs with Macs. Now, at the time I was the self-proclaimed "King of all PC's." Linda told me the Macs cost less to maintain and they connected to the network more easily than the Dells. I told her the only thing I was worried about was if a PC type keyboard and mouse would work on a Mac and if the Mac could run Windows. Once that was proven to me, I gave my ok. The next day, I finally reached my tipping point. I was listening to Rush Limbaugh on the way into the college and he was going on and on about his Macs, about how wonderful they were. So Linda and Rush tipped me over. That day I called the local Apple store and went down and bought my first Mac, a beautiful little white Macbook with my educational discount, which was about a $100 savings. Going from PC's, something I've used forever it seems. I went from a Commodore to one of those IBM single density double disk drive machines around hmmmm 1982 or so. Switching to a Mac, gang, isn't that painful. Little things you adjust to. Like remembering to go to the upper LEFT on a Mac to close a program instead of the upper right. But really, that took about an hour or two. Here it is about two weeks after switching to a Macbook and getting an iMac to replace my Gateway main desktop so I am now one of "them" - a Mac true believer. You know the Apple commercials out now with the hipster Mac user and the whiney PC guy in the crumpled suit? 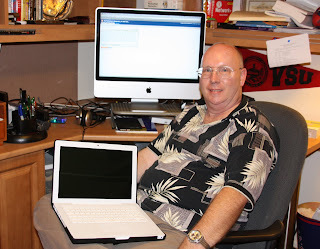 I'm still the guy in the crumpled suit but now I use Macs! haha. 1. Security threats... gee, I don't run any virus programs. Is that right or wrong on a Mac? 2. It's fast. Few things run in the background to slow the machine down. 3. The stuff works. It sounds like an ad, but it's true. Everything seems to work well together. There are lots of little things built in that are very useful, like Time Machine, a painless way to backup your computer. Set and forget. I like that. 4. No more defrag. Yeah! 5. On the Macbook, the power connector stays in place by magnet so if somebody trips on the cord, it just pops out instead of pulling your laptop on the floor. Again, the little things they do right. 6. The iMac I have is a 24 inch beauty. I mean BEAUTY. The screen is bright and everything is built in. I bought 4gb of RAM for both the Macbook and iMac and the thing flies. 7. After switching to Macs, I discovered I had a program I loved (Camtasia by TechSmith) that only ran in Windows. So I went to our tech guru Carol Myers and she set me up with a copy of Parallels. As the kids would say in text, OMG! I installed Parallels on both Macs, then installed Windows XP inside and it runs FASTER on a Mac!!! Then I installed my copy of Camtasia and it works beautifully. So PC users, you are having fewer and fewer excuses. 8. Widgets. I have time set up for Phoenix and Seoul, where I went last month. I have the five day weather forecast for Phoenix. I also have it set up to display movie times. And, this is neat, airline schedules. 9. The Mac "mighty mouse" really does have a right click button. Just go into mouse preferences and set it up that way. And your old PC keyboard and mouse will work, too. 10. No more stupid registry. When you are done with a program on a Mac, just drag it to the trash. Have I had any problems? Not with the Macs. My problem was getting rid of the PC laptop (thankfully bought by fellow faculty Patri Mays) and Gateway desktop and monitor (bought by EZ Trade in from Ebay.com). The other thing I found is a Mac holds its resale value better than PC's. As Johnny Carson used to say, "I did not know that." Oh, one other minor annoyance is that sometimes the Safari Internet Browser doesn't work with some sites, like Hotmail (I wonder why, Microsoft?). All you do in that case is switch to Firefox. I don't want to come off as one of those pesky Mac people who put down Microsoft, but really... Vista is nothing more than Windows Me, part deux. Microsoft lost me as a customer like the Big 3 automakers lost me decades earlier. QUIT MAKING JUNK! Computers are a maturing industry and there should not be the patience out there for not-ready-to-be-sold software and hardware. Consumers and businesses should just stand up and say no. Now, you can buy a Mac. Even though Apple is not pursuing the enterprise market, companies are buying Macs because individuals are buying for home use. If you consider the total cost of ownership, you will find Macs simply are cheaper in the long run. Oh, and they just work. Welcome to the computing heaven Jim! I love the "quit making junk" comment -I couldn't have said it better myself! That's some nice and clearly explained reasoning for your switch. I've not used a Mac, but have always had an interest. Maybe someday (when I have money). I run Windows XP in VMware on Linux and have the same experience, it works just fine. I do all my lab assignments this way, running Office 2007 in VMWare on Linux. I would enjoy knowing what you think... please leave a comment. Skylum is my choice for photo editing plugins. Click HERE for great deals on all the Skylum software! Try code JGP3 for $$$ off. I started with them when they were MacPhun, so I've used the software for years. Skylum has a YOU TUBE channel! Learn more about how to use all their products by going HERE. Click HERE to learn more about PhotoLemur! Use the code JGP3 for $$$ off! It's one click. I use it as a plugin for Lightroom. Take your drone photography to new heights in one click with AirMagic. Click HERE to learn more! Use the code JGP3 for 20% off. Get SmugMug at a Discount! Want your own SmugMug site? Get it at a discount by going HERE! James Gordon Patterson. Powered by Blogger.